Albertus Magnus, doctor universalis, Earl of Bollstaedt, who called himself "Brother Albert of Lauingen" is known by history as Dominican monk and prior, bishop and nuncio, all-embracing scholar and Rector of the University of Cologne. Additionally, he is respected as naturalist and philosopher. Albertus Magnus was born in Lauingen in 1193 and died on November 15, 1280 in Cologne. Stations of his scholaric life were Hildesheim, Freiburg, Regensburg, Strasbourg, Cologne and Paris. His studies and teaching, whose end was a holistic view of God's creation, enclosed theology, botany, zoology, physics, chemistry, geography, and mineralogy. Among his pupil were outstanding thinkers like Thomas of Aquin and Master Eckart. Since his knowledge in mathematics, geography and astrology was incredible embracing and ahead of his time, his calculations were still in use 250 years later at the court of King Ferdinand of Spain to decide the chances of success for Christopher Columbus' plans. Legend tells, that Albertus Magnus, among his other achievements, also developed the plan of Cologne Cathedral. One night, while at sleep, four men appeared at him: An old man, an elder man, a man in his best years and a boy. In their hands were a pair of compasses, a measure of angle, a standard, and a pair of scales. Close after, the Virgin Mary, entered. Following her introductions, the four men outlined the groundplan of a cathedral on the room's walls. Later on, as the saying goes, Cologne Cathedral was build after this plan. Across European countries, smaller churches and chapels, which were doubtlessly built before the development of all cathedrals, already show the first high arches, made walls, and propped up buttresses. The first gothic attempts therefore have to be seen as building experiments and ideas, which the crusaders brought back from the Orient. Strangely and mysteriously, the groundplans for gothic cathedrals were developed almost over night from scratch. In just one Generation the first monumental buildings grew up as first witnesses of a new era. 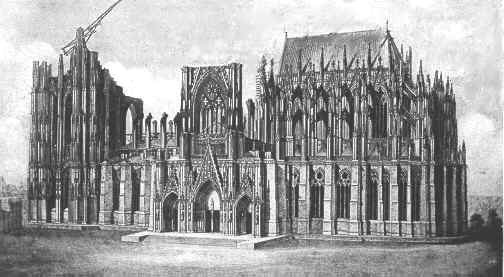 When Archbishop Konrad von Hochstaden on August 15, 1248 layed the foundation stone for the new cathedral in Cologne, his attempt was to replace the former burnt out one by latest architecture. According to his wish, the Cathedral was planned to become the largest gothic church in Germany with a five nave basilica and three transepts. The expression "Gothic" originates from the Italien renaissance artist and building master Vasari (1911-1574). Before Vasari, Gothic was named the "German style", or, as Vasari put it, "dei Gotthi". Medieval stonemasons' lodge documents talk of "Albertian manner" or "Albertus System". Alongside the name "Albertus", as gothic expression of style, the name "Argentinus" is to be found in addition. The word Argentinus indicates Strasbourg, the former roman colony Argentoratum. Albert von Bollstaedt lived around 1200 in Strasbourg. Professor Wallraf reports in his treatise "Dom zu Köln" ("Cologne Cathedral"), which is part of his "Ausgewählte Schriften" ("Selected writings"), 1861, that Albertus Magnus was central creator of the construction plan of Cologne Cathedral on behalf of his fatherly friend Conrad von Hochstaden, Archbishop of Cologne and Duke of Westfalia. Professor Carl Alexander von Heideloff (1789-1865), master builder and restorer in Nuremberg, found a Benedicine stonemasons' lodge book, in which it is said that the gothic style in some stonemasons' lodges was named after Albert and that it was this Albert, who completed this architectural style. His (Alberts) achitectural system, it is said, is based on the System of "Achtorts" and takes several ideas of numerology and cabbalism into account. Albertus Magnus has often been on the building site for historical interest. Albertus himself reports of findings from roman times in connection with the excavations for Cologne Cathedral.